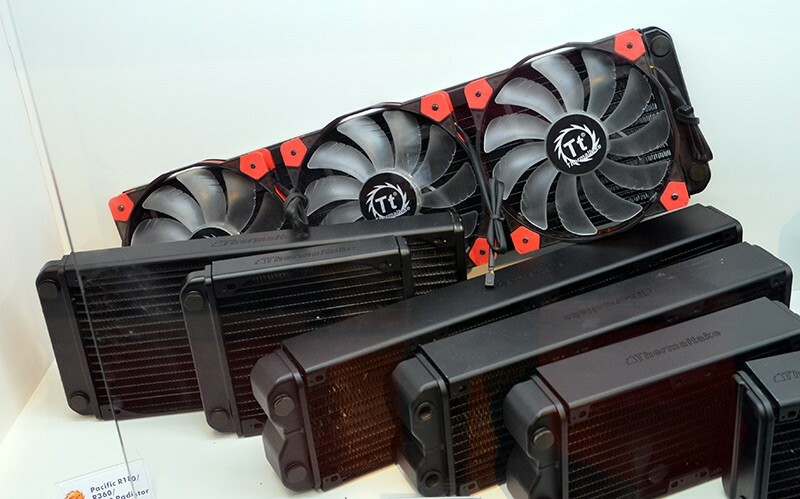 Earlier today I swung past Thermaltake’s Computex 2014 booth, and the standout products they had on show were two massive liquid coolers from their expanded range of liquid cooling solutions. The first is a huge 360mm radiator for their new line of liquid cooling equipment, including pumps and reservoirs, which dwarfs the smaller radiators that can be seen in front of it in the picture above. Despite being so large, it can mount to either the front or top of some of Thermaltake’s latest cases. The other liquid cooling product new to Computex is the Water 3.0 Ultimate, a triple-fan closed-loop cooling solution for CPUs that slots into their existing closed-loop line-up. Naturally this is the highest-end product in the line, and will provide the best cooling for your CPU. A system decked out entirely with Thermaltake’s new liquid cooling gear can be seen below, clad with a ton of red LEDs.